I like barangays: the word and the concept. Loosely translated, it refers to neighborhoods or suburbs or parishes or even hamlets – that is, the smallest administrative unit. During my trips, I crossed barangays very quickly (in passenger vans) or slower, in buses, jeepneys or riding my motorbike. In most of the regions where I traveled, the last barangay of any given town would almost overlap with the first of the following one, with their colorful welcome and farewell signs. Further, some of the sights that stick to my memory where found passing through some of them. Chapels around Anda, Bohol. Fiestas in South Cebu en route to Dumaguete. Chapel close to Anda, Bohol. Of special significance to a madrileño like me. Catching a fiestas procession from the bus. So Spanish yet so far away from Spain! 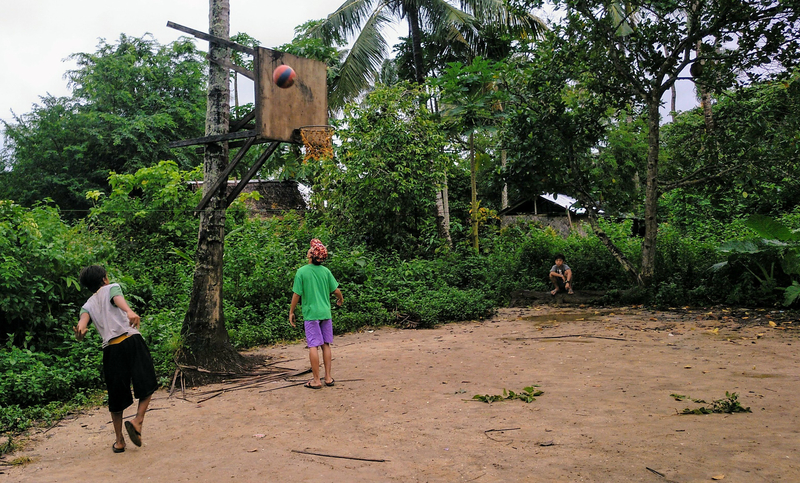 Basketball is also an important part of the visual imagery in the Philippines. Kids talk NBA basketball and wear basketball shirts. And there’s a basketball net to be found anywhere and everywhere. Kids shooting hoops next to Merimegmeg Beach, El Nido. I thought that Thailand was unbeatable as regards variety of travel transport. Wrong. In the Phils I got to experience the full package, from aircon buses to jeepneys, trycicles (aka trikes) and motorcycle taxis, sweetly dubbed habal-habal. Why do you repeat the word? I asked someone. Dunno. We like how it sounds. Like “sari-sari” (small convenience store) or “halo-halo” (the desert). A cool jeepney parked at the entrance of the Candapdapan rice terraces, in Bohol. As you know, I’m a language aficionado. A Spanish language aficionado, to be more precise. So no surprise I enjoyed seeing Spanish words on signs, or hearing speakers of Visayan count in Spanish or use our names for weekdays. I was also treated by a local traveler to a crash course in the differences between Visaya and Tagalog, especially as regards intonation and directness of discourse. Fascinating. Street food in the Phils is nowhere as good as in Thailand, but there are interesting sights nonetheless. Barbecue is readily available, offering such tasty and crunchy delicacies as chicken’s head and pork intestines. Intoxicated by a bottle too many of Red Horse, I did try them all. Perhaps the best was to see parties of family or friends roasting a pig on the street, cooking a delicious lechon for a birthday party. My reign for a plate of lechon! Religious building were also an interesting sight in my trip. Not only the actual places, but the experiences of seeing people of my own confession so far away from home. In Dumaguete, I saw what seemed like a full-fledged Rastaman sporting a Bob Marley shirt kiss the ring of the local priest. Striking. I was also struck by the life inside them – people, lots of people, all sorts of people, young an old but especially young. In Anda I opened the church door only to discover dozens of teenage kids watching a movie on a giant screen. The rides getting there, the beauty, the cool water. I’ve written about all that here. I will never forget the colour of the sea in Palawan or Siquijor. Or the beaches in Anda, Bohol. Or discovering White Beach after a muddy run from Port Barton. If Ko Samet in Thailand helped me discover the pleasures of beach-hopping, it was in the Phils that got it in my heart to find more beaches like White Beach – as well as making it back to Palawan for more! White beach – I miss you!